The Willow Warbler is another summer visitor to Wales. The male and female are of very similar appearance. These small, fairly quiet songbirds live in trees and bushes through the spring and summer months. Willow Warblers are very common in rural gardens, where they feed on insects and spiders. 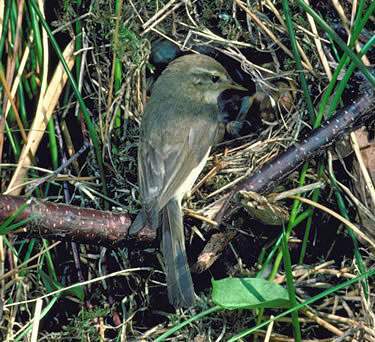 Willow Warblers make their nests from grass lined with feathers, usually on the ground among vegetation or small bushes. They generally produce six to eight eggs, which are white with light red spots. 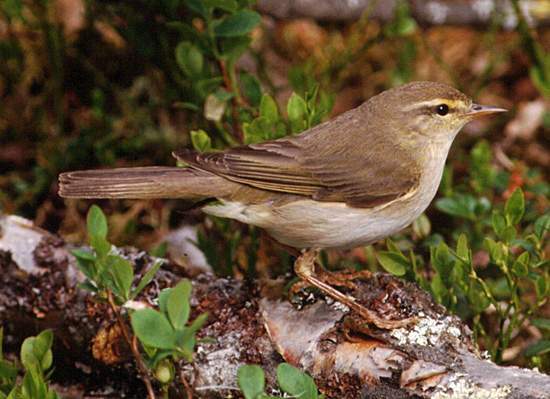 Its clear warbling song helps you distinguish the Willow Warbler from the chirping chiffchaff. These two birds look very similar but they sound quite different. This page includes pictures kindly contributed by the Countryside Council for Wales and Melvin Grey.